I’m OUT & PROUD. There, I’ve said it. Not just at being openly Gay, but at being a volunteer at Henry Smith House. Part of Guidepost Trust, Henry Smith House exists to provide direct services in the community for people with or recovering from mental ill health. In February 2009 the Museum Services and Henry Smith House made sure that Lesbian, Gay Bisexual History Month was marked in the Watford area. National co-chair of ‘Schools Out’ and ‘LGBT History Month’ Tony Fenwick spoke on famous LGBT people past and present. Sitting in the museum listening to tales of achievement in the art and science, of authors and explorers, heroes and villains, whilst in turn being benevolently looked down on by Watford’s own great and good – the portraits of the Essex Family! I was indeed proud to be a volunteer at Henry Smith House. I reminded them that I don’t volunteer lightly in fact I’m very choosy about what I want to put my energies in, however when I reduced my working hours as a social worker from full time to 30 hours I new what I wanted to do with some of the free time. Be a volunteer at Henry Smith House. Proactive in equal opportunities and Anti discriminatory Practice. Proactive in getting the voice of the service users heard at all levels local, strategic, and national. Proactive in being a part of the local community. 2010 and LGBT History month is upon us again. On the 10th Tony Fenwick will be asking us “Why Do We Need a History?”. On the 24th author Joanna Briscoe talking at the library about her recently televised book “Sleep With Me” . 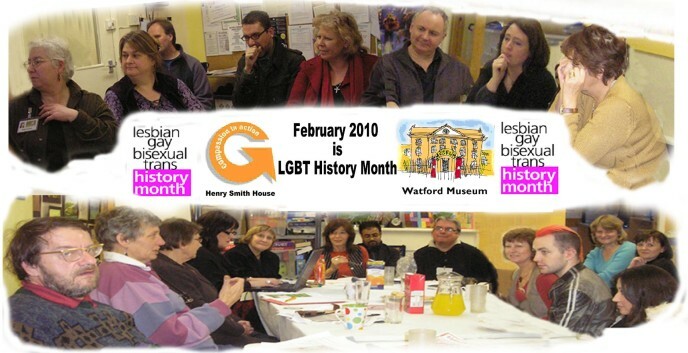 You are reading this, because throughout the month in a joint project the Museum and Henry Smith House have established an LGBT history section on the Watford Junction web site. How inclusive and proactive is that? Henry Smith House has been the rallying point for key agencies like Education, Police, Libraries, Health and Voluntary Organisation alongside LGBT organisation and individuals, to coordinate a range of events. Alongside those agencies as far as I could see every one of Henry Smith House’s own staff all wanting to be actively involved. I’m OUT & PROUD to say I am a volunteer at Henry Smith House, who recognise me for all that I am and part of who I am, is being Gay. This page was added on 22/12/2011.